Exhibition Runs June 5-Sept. 13 In Washington, D.C. This summer, Austin-based visual artist Ysabel LeMay proudly represents the state of Texas at the National Museum of Women in the Arts (NMWA) in Washington, D.C. From June 5 through Sept. 13, LeMay and a dozen other artists from diverse locales and disciplines explore the connections between women, art and nature in Organic Matters — Women to Watch 2015, the fourth installment of NMWA’s biennial Women to Watch exhibition series. 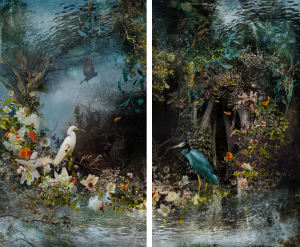 Curated by NMWA’s Associate Curator Virginia Treanor, LeMay’s work selected for the exhibition is “Reflection” (2014), a powerfully emotive diptych created through her signature hypercollage technique. Traveling the world to embed herself deep within the wilderness, LeMay gathers bounties of digital images, from which she harvests countless fragments. 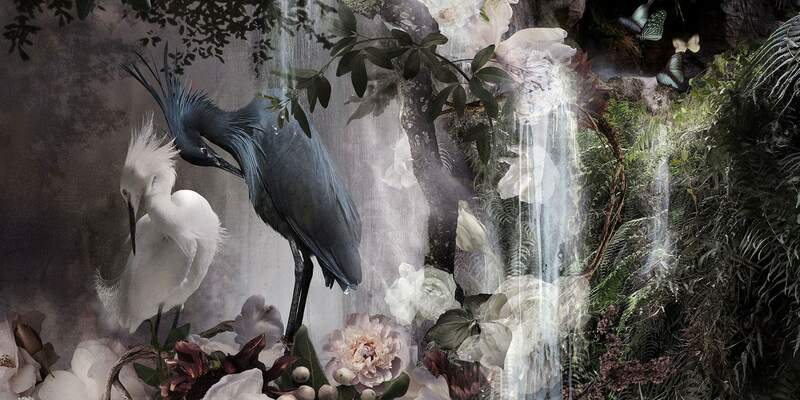 These she painstakingly weaves into large-scale tableaus that reach the richness and resplendence of baroque painting. “Reflection” continues a narrative established with an earlier work, “Les Natur­alistes,” invoking nature’s infinite pro­­­­c­ession of interrelationships as a guide and inspiration for our own existences. The living world is the vital essence of LeMay’s work, perfectly suiting it to the theme of Organic Matters. The exhibition challenges preconceptions about women, art and nature, exposing a surprising range of perspectives and showcasing the rigor and profundity with which the artists engage their subject. Sponsored by the Texas State Commission of NMWA, LeMay exhibits “Reflection” alongside works in a variety of media by selected artists from the states of Arkansas, California, Georgia, Kansas, Massachusetts, New Mexico, New York and Ohio, as well as Chile, France, Italy and the United Kingdom. Founded in 1981 and opened in 1987, NMWA is the only museum solely dedicated to celebrating the achievements of women in the visual, performing and literary arts. LeMay is proud of her inclusion in its exhibition history, all the more at being able to do so as an emissary of the vibrant Texan art community. For more information on the museum and the exhibition, visit nmwa.org.